This is a mob of the type of Shorthorn cattle J. J. Leahy liked to breed and have ready to market. He had been running cattle from his earliest days but, apart from dealing, wool growing had been his biggest enterprise in the ninety twenties to the extent of being the biggest wool grower in the country. But when the wool market declined during this period he was increasing his cattle breeding herd. He then heard about this property with a big herd of the type of Shorthorns he was looking for. Although it was a leasehold title, it was the cattle he was after! 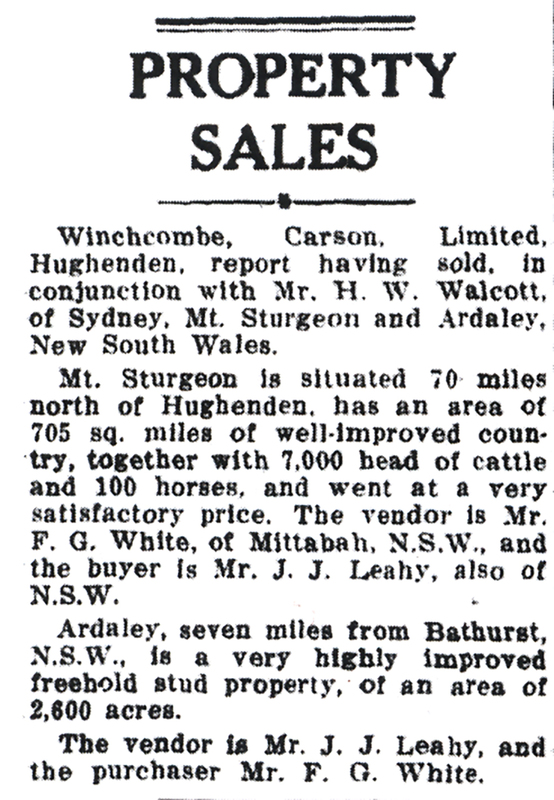 The Queensland Country Life of Thursday 28 November 1935 report (from ANL’s Trove web site) below explains how this sale came about. You should note Ardsley is misspelt. Below, again from Trove, is part of a newspaper article in Smith’s Weekly (Sydney) dated Saturday 24 April 1926.
richest limestone country in Australia. latest proposal for this private track. There is a big write up following in this article with a lot of information about J. J. Leahy’s thoroughbred horse breeding enterprise, which I will post in another Blog. 2 Responses to How did J. J. Leahy come to buy Mt. Sturgeon. Marguerite, thank you firstly for looking up my web site and its Blog, secondly for your comment. The main purpose for this site is to let people know that I have written two books which I would like them to read. I am using my blogs to post information I have found since the books were published. The Australian National Library has a major project scanning old newspapers and placing the results on their Trove web site. This is an absolute treasure trove of information for me but unfortunately, there are few photos and these are of poor quality and not worth using. In my defence I should say if you were to look back at earlier blogs I have included quite a lot of photos, the aircraft used by my father in his business is a good example. Many people who have gone to the trouble to read my books have commented favourably on the number of photos I have included in the books. There is also a Gallery on this web site with a number of colour photos connected with the books.